One of the most notable characteristics of the pipe organ is its ability to produce an amazing array of sounds and noises. This is thanks to the variety of pipe designs and styles that are placed into the instrument. The organ’s sounds quality, or “timbre” is shaped by the length and width of the pipe, its shape and position within the instrument, and the shape materials of construction. 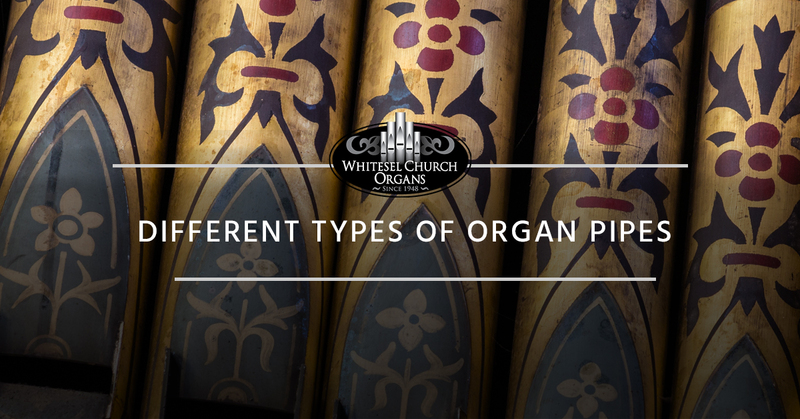 In today’s blog, Whitesel Church Organs will discuss some of the different types of pipes found in the organ. Made from either wood or metal, these pipes have no wooden parts, essentially acting as a giant whistle. The pipe makes sound by moving air in and out of the pipe itself. When the pipe is played, the air inside the pipe is moved, creating a low-pressure condition. The air outside of the pipe is forced into the mouth of the pipe and brings a wind sheet with it. This process basically brings air in and out of the pipe in a repeating pattern. The back and forth movement of air across the mouth of the pipe creates what we perceive as sound. A reed pipe creates sound thanks to the use of a vibrating reed that interrupts the flow of air through the pipe. This pipe acts like a giant party horn. There is a brass or bronze resonator that’s attached to a reed block. The sound of the reed pipe is influenced by the size of the pipe, the materials it’s made of, the shape of the resonator and the reed being used. Rather than having the reed flat against the resonator, the reed is slightly curved so that that it flutters against as opposed to slaps the side of the resonator. The curve of the reed influences the timbre and smoothness of the resulting sound. Similar to the reed pipe, these pipes use a resonator and reed to create a range of sound. Interestingly, these pipes are made with very short resonators, meaning that they are not matched to the frequency of the pitch of the pipe. The result is that the sound emanating from regal pipes is very buzzy and bright. It is often played along with other pipes to create a very pleasant sound. Diaphones are very loud and have a timbre that is somewhere between the sound of a reed and a flue pipe. Rather than a reed tongue like a reed pipe, the diaphone uses a valve disc that’s attached to the end of a leaf spring. This disc controls the frequency and pitch of the pipe. The length of the diaphone’s resonator is matched to the pitch for its position in the rank of pipes. The diaphone works by drawing air quickly across a beater box, which moves the leaf spring and the valve disc. This opens and closes the resonator rapidly, which allows short bursts of wind to enter the pipe and deliver its loud buzzy sound. The pipe organ is capable of delivering an array of sounds that help to convey the feelings and movement of a piece of music. It’s what makes the sound of the pipe organ so captivating to listen to. If your pipe organ is in need of repairs, contact Whitesel Church Organs today and ask about our free organ assessment. We’ll get your organ back into working shape in no time.